The question of interim leadership of the movement against Islamic regime in Iranian opposition seem to have turned into a curse lingering above opposition groups for more then two decades now. Islamic rulers of Iran were very successful in disabling all oppositions to them by resorting to extreme slogans and actions in the beginning and then using �god given gift� of Iran-Iraq war, which started in best possible time for newly established Islamic Republic in those chaotic days. After taking away the slogans of �death to America� and �death to Israel� from leftist groups, which seemed to have dominated the atmosphere of politics through chanting extremist slogans, Islamic regime was able to impose itself as the champion of �anti Americanism� by organizing a suspicious move in attacking and occupying Embassy of United States. The irony is that same Islamic rulers opposed to occupation of same embassy, as an accepted norm in international relations, a few months earlier and kicked a group of armed leftists groups of Mujaahedin and Fadaaeeyaan khalq, which were considered as two �arms of revolution� by some people, out of the embassy! Occupation of American embassy by a group, which later called themselves �Muslim students who follow Khomeini�, opened a new chapter in the life of Islamic regime and the future events which were connected to this event, one way or another. After occupation of American embassy, Islamic rulers who had put on a great show of �anti imperialism� through slogans and actions, had the opportunity to implicate anyone they wished as American spies, by linking them to American embassy with �documented proofs� coming out of the embassy! Many members of the interim government of Mr. Bazargan whom was appointed by Khomeini himself to form the first Islamic revolutionary government in Iran, were among those who were accused of conspiring against �Islamic Revolution� because of their numerous contacts with American officials regarding different issues. A few months afterwards, discovery of Nojeh coup by Islamic regime resulted in execution of many military and non-military personnel and a wide spread wave of killing of Iranian people for anything which was considered �anti revolutionaries� by theocratic regime�s revolutionary judges. This process started by extending the rulings of Islamic revolutionary courts to some of former allies of the revolution which were only applied to elements of previous regime about a year earlier! During those months that some of the forces, currently opposing to Islamic regime, still considered themselves part of revolution, the last prime minister of previous regime, Dr. Shapur Bakhtiar, had started a nationalist resistance movement against Islamic regime with help and cooperation of some of friends and allies under his leadership. Strangely enough, late Dr. Bakhtiar was criticized and opposed by some of the opposition forces that instead of joining his movement had decided to discredit him and question his leadership! Right or wrong, some people believe that Nojeh coup was linked with Dr. Bakhtiar�s resistance movement and its failure was a major blow to spirit of opposition forces at that time. Another member of former system who had also initiated a nationalist resistance movement was Dr. Manouchehr Ganji who served as a minister in previous regime. This movement and its leadership was also target of critiques by many who not only did not take any practical measure against the suppressive �revolutionary� regime but also did not have anything to offer other than same old worthless �politically correct� and endless �talks�! I was inside the country in some of those years and could see how a big portion of Iranian society, was enthusiastically following the activities of these two groups that could reach their voice to Iranian people inside the country through short wave radios. The feeling of regret about the whole business of �revolution� and its consequence which had taken over the nation in first few months after �Islamic revolution�, turned into a huge disappointment after major crackdown on secular opposition forces who were under extreme pressure and in constant retreat against Islamic regime�s suppression. Start of Iran-Iraq war provided the brutal revolutionary regime with yet another excuse to expand its suppressive actions against Iranian people and opposition forces while all of those forces had lined up behind Islamic government to avoid being accused of betrayal to the nation. The war became the best tool to measure the loyalty of people to revolutionary regime and war, was called a �gift from god� by leader of Islamic revolution, ayatollah Khomeini. About a year later, explosion of the office of �Islamic Republic Party� which was attributed to former ally of Islamic regime, the group of Mujahedin Khalq, resulted in killing of many major figures of Islamic regime but the consequence of that event for Iranian people was nothing other than more brutal suppression and in wider scale. Many young Iranians, as young as 12-14 years old, were executed because of having a piece of paper from Mujahedin Khalq in their hands. Policies of Mujahedin Khalq Organization which had turned its attention to heavy recruiting of younger Iranians from beginning days of Islamic revolution in fact cost many lives as a result of mistakes and flaws in their policies. These flaws from one side and heavy propaganda of Islamic regime from another side had a heavy cost for Mujahedin Khalq Organization, or MEK, which presented itself as the only alternative for Islamic regime. After migration of main MEK leadership and the first president of Islamic regime, Mr. Abulhassan Banisadr who was deposed from office by clerics of Islamic regime, and killing of Mr. Moosa Khiabani and Ashraf Rajavi, who were important elements in MEK leadership inside Iran, The third major foreign based opposition group was formed by Mr. Banisadr, Mr. Rajavi and Mr. Matin-Daftari. Mr. Matin-Daftari who is a grand child of late Dr. Mohammad Mosadeq had separated himself from Iranian National Front and started a new political entity called �Iranian Democratic National Front�. Start of this new alliance, which was accompanied with a political marriage between Mr. Rajavi and Mr. Banisadr�s daughter, created some new hopes inside and outside the country which did not last very long and one more time, Iranian scattered opposition failed to provide a real solution to the complicated political problems facing Iranian people. The desperate situation of Iranian opposition outside and paralysis of the opposition inside the country through brutal crackdown has created opportunity for some opportunists to come forward and present themselves as a solution and take advantage of this desperate situation! The most important issue in this regard is understand that current situation is extremely sensitive and our nation is facing the most serious threat on its existence in the history! This situation calls for a prompt action and a pragmatic solution without getting into many details through endless talks that has not accomplished anything for our nation other than wasting time! Iranian elite need to participate actively in deciding about Interim leadership of a national movement as soon as possible by emphasizing on uniting factors and elements which are shared by as many as possible without insisting or expecting everyone to agree. Those who expect to apply rules of democracy on a resistance movement like an established democracy are asking for impossible and are part of the problem rather than solution! There is no absolute 100% even in democracies and if we want to move forward then we need to �act� quickly with as much force as we can get and in this scenario, the well known national figures have the highest responsibility and are in highest priority. As a solution to achieve this, my suggestion is a formal, open, clear, decisive and firm invitation to all nationally recognized figures of opposition by Prince Reza Pahlavi to form the leadership of this movement for the sake of our nation. Public should be informed of anyone declining the invitation or not responding in a formal manner in certain period of time. There is no time to waste! Let�s not let the petty differences in views drive our nation towards a catastrophic destiny. Let�s not wait for others to arrange this gathering for us and prove that we can represent a nation with thousands of years civilization. Thank you for your visionary post and excellent recommendations. 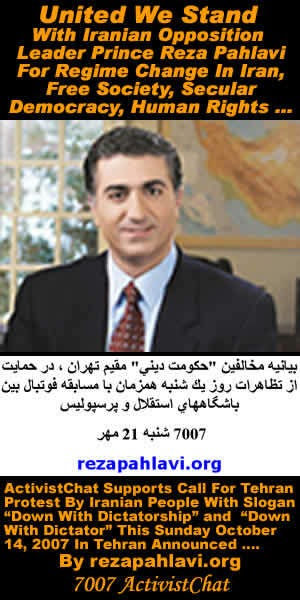 Due to the facts that Prince Reza Pahlavi has the best name recognition in Iran, in past 28 years has shown his commitment to establish Secular Democracy, Free Society and Human Rights in Iran after regime change therefore it is natural that great majority of voiceless Iranians in our motherland Iran are accepting Prince as their leader for freeing their homeland . ActivistChat is respecting Prince leadership and reserve the rights to point out our possible future disagreement or differences by stating facts and our recommendations for possible leadership consideration. At this critical moment in our history, it is absolutely essential to mobilize all our forces and strengthen the opposition disconnected Part time Units in order to free our motherland. There are many Iranian political/cultural groups, democratic organizations that they are working hard and making sacrifices for freeing our motherland in order to replace the backward Islamist Taazi belong to 1400 years ago with a free society, secular democracy and human rights. The world has changed and time of expecting one person as a leader of very complex Iranian oppositions and 70 million Iranian people as a hostage to the Islamist Taazi regime with 100s of issues might not be wise expectations because no leader can deliver everything and miracle. In the difficult circumstances that the Iranian leader can not act quickly, deliver miracle and provide direction due to limited resources, the opposition groups and individual activists should consider to act through distributed team effort and media and don�t wait for the leader direction on every issues. Managing our expectations from leadership is the key to our future success. One of the key to success is educating Iranian youth inside Iran regarding Distributed Decentralized Disconnected Part Time Resistance Movement For FREE Iran , FREE Society, Secular Democracy, Human Rights and how to Fight current foreign Islamist invaders and Occupiers of Iran (Tazism) and Beyond in 360 degree manner and don�t rely 100% on one person or outside support or help from UN �. Protect our right side, our left side, attack Taazi enemies weaknesses from all sides to destroy them and move forward for complete victory �. I agree 100% that the load of leadership of the movement for removal of Islamic regime can not be put on the shoulders of single leader. This is exactly what I have brought up in my statement in suggesting formation of a leadership from different willing parties through direct and open invitation by Prince Reza Pahlavi. The reason for suggesting Prince Reza Pahlavi as a host to initiate such process is because he has been more actively involved with all the issues related to our nation than any other nationally known Iranian figure. It could have been someone else but I honestly could not find any name who enjoys same or more credibility and recognition with Iranian society as Prince Reza Pahlavi does. You are absolutely right that we should not expect miracle from leadership and forget our own responsibilities. In fact most problems arise if we fail to perform our duties as a patriotic citizen as we have seen before. We have been wating for a real action from our Iranian opposition groups to go "head on" with Islamic regime for a very long time. It's time for someone from those who have a claim or a name in this national struggle to come forward and offer something to finalize this dark chapter in the history of our nation. There is no time to waste and this opportunity should not be missed. Iranian people inside have shown their readiness for change in many ways and it is responsibility of opposition forces to do their task at this crucial times to satisfy the needs of our society for a national leadership in this movement. Longer delay will result in future regrets which will have no use and no effect. we had more than enough of "talks" and discussions, it's time for real action now. Thank you for your excellent article and opening discussion regarding one of the most complex Iranian subject. It goes without saying that good leadership is crucial to any complex successful movement for achieving Regime Change in Iran with optimal results for Free Society, Secular Democracy, Human Rights �. . But, what makes a good leader for Free Iran ? The answer is that there are many factors that contribute to good leadership. Due to the facts that many of us don�t know what is the framework and model of leadership and expectations different people have in mind therefore if you agree independent of who is going to be dominating leader of Free Iran in future may I suggest to discuss the Concepts of Leadership, Principles of Leadership, Attributes, expectations in this thread. What do we want from good leadership? How much can we contribute to good leadership? The six most important words: "I admit I made a mistake." The five most important words: "You did a good job." The four most important words: "What is your opinion." The three most important words: "If you please." The two most important words: "Thank you,"
The one most important word: "We"
The least most important word: "I"
Leadership models help us to understand what makes leaders act the way they do. The ideal is not to lock yourself in to a type of behavior discussed in the model, but to realize that every situation calls for a different approach or behavior to be taken. Two models will be discussed, the Four Framework Approach and the Managerial Grid. In the Four Framework Approach, Bolman and Deal (1991) suggest that leaders display leadership behaviors in one of four types of frameworks: Structural, Human Resource, Political, or Symbolic. The style can either be effective or ineffective, depending upon the chosen behavior in certain situations. In an effective leadership situation, the leader is a social architect whose leadership style is analysis and design. While in an ineffective leadership situation, the leader is a petty tyrant whose leadership style is details. Structural Leaders focus on structure, strategy, environment, implementation, experimentation, and adaptation. In an effective leadership situation, the leader is a catalyst and servant whose leadership style is support, advocate, and empowerment. while in an ineffective leadership situation, the leader is a pushover, whose leadership style is abdication and fraud. Human Resource Leaders believe in people and communicate that belief; they are visible and accessible; they empower, increase participation, support, share information, and move decision making down into the organization. In an effective leadership situation, the leader is an advocate, whose leadership style is coalition and building. While in an ineffective leadership situation, the leader is a hustler, whose leadership style is manipulation. Political leaders clarify what they want and what they can get; they assess the distribution of power and interests; they build linkages to other stakeholders, use persuasion first, then use negotiation and coercion only if necessary. In an effective leadership situation, the leader is a prophet, whose leadership style is inspiration. While in an ineffective leadership situation, the leader is a fanatic or fool, whose leadership style is smoke and mirrors. Symbolic leaders view organizations as a stage or theater to play certain roles and give impressions; these leaders use symbols to capture attention; they try to frame experience by providing plausible interpretations of experiences; they discover and communicate a vision. Greatness is not achieved by words but by hard work, difficult choices, actions and sacrifice. Iranian opposition leadership greatness will be measured by good judgments , good actions, taking risks, sacrifices, ability to mobilize all forces and not just words. - What are the list of Urgent Actions Inside Iran by Iranian people? - What are the list of Urgent Actions Outside Iran? اين روزها، با اعلام خبر سفر رييس جمهوری روسيه، آقای پوتين، و هياتي از کشورهاي تازه استقلال يافته ي اطراف درياي کاسپين، زنگ خطر بزرگی در ارتباط با گنجينه ها و ميراث تاريخی ايرانزمين در سرزمين مان به صدا درآمده است. گفته می شود که يکی از دلايل حضور اين افراد در ايران مذاکره بر سر مالکيت دريای کاسپين است؛ دريايي که مالکيت آن تا کنون و بر اساس قراردادهای کاملا رسمی سال های 1921 و 1940 به طور مساوی بين روسيه و ايران تقسيم می شده است. اکنون سخن بر سر آن است که اين مالکيت چگونه بين پنج کشور تقسيم شود. در اين راستا، پيشنهادی که روسيه برای اين تقسيم به ايران داده، کلا در جهت حفظ منافع روسيه و عليه منافع سرزمين ما و بسيار ناعادلانه و هراس انگيز است. توجه داشته باشيد که تا کنون، يعنی اکتبر 2007، مالکيت ايران بر دريای کاسپين از نظر قوانين بين المللی هيچ تغييری نکرده است، يعنی ما همچنان صاحب نيمی از دريای کاسپين هستيم و در عين حال جمهوری های تازه استقلال يافته در همان سال 1991 کليه تعهدات بين المللی شوروی سابق را که سهم ايران را بر اساس 1921 و 1940 تعيين می کردند تضمين کرده اند. به اين ترتيب هر قراردادی که از اين پس با روسيه و کشورهای همسايه بسته شود پيمانی تازه است که دولت آقای احمدی نژاد نقش اساسی و مستقيم در آن خواهد داشت. کميته بين المللی نجات پاسارگاد بدين وسيله اعلام می کند که هر پيمان غير عادلانه ای که، عليه سهم ايران در اين دريای تاريخی، تصويب شود، خيانتی آشکار به ملت ايران است و مسئوليت آن صرفا با دولت آقای احمدی نژاد، و البته همه ی مسئولان دولتی و نمايندگان مجلس اسلامی، خواهد بود که بر پای چنين پيمانی امضا خواهند گذاشت. خبرگزاری حکومتی ایرنا: كارشناسان سياسي و راهبردي روسيه، در مورد حل مسايل مورد اختلاف كشورهاي حاشيه درياي در اجلاس سران اين كشورها در تهران ابراز خوش‌بيني كردند. اين موضوع روز پنجشنبه در ميزگردي كه با عنوان "سفر ولاديمير پوتين به تهران و مساله خزر" با حضور سه كارشناس مشهور روس در خبرگزاري ريانووستي روسيه برگزار شد مورد تاكيد قرار گرفت. رييس آكادمي مسايل راهبردي روسيه در اين نشست گفت: اجلاس سران حاشيه خزر كه روز ‪ ۱۶اكتبر(‪ ۲۴مهرماه) در تهران برگزار مي‌شود، مي‌تواند مسايل مورد اختلاف در تقسيم درياي خزر را حل كند. "لئونيد ايواشف" تاكيد كرد: بدون شك نخستين ديدار رييس جمهوري روسيه از ايران به روابط مسكو و تهران تحرك تازه‌اي نيز خواهد بخشيد. به گفته اين كارشناس روس، دورنماي حل مسايلي كه در تقسيم منابع درياي خزر وجود دارد در چنين سطح عالي بهبود خواهد يافت. "رجب صفراف" رييس مركز مطالعات ايران معاصر در روسيه نيز با اشاره به امضا نشدن موافقتنامه رژيم حقوقي درياي خزر تا زمان حاضر، در مورد نتايج اجلاس تهران و سفر پوتين به ايران ابراز خوشبيني كرد اما گفت: اختلافات بين كشورهاي حاشيه خزر در مورد نحوه استفاده از اين دريا، جدي است. وي در مورد تقسيم درياي خزر پس از فروپاشي شوروي سابق گفت: با توجه به اينكه اين دريا بين ايران و شوروي سابق بصورت پنجاه، پنجاه تقسيم شده بود، ايران مي‌توانست حتي بر اين سهم پيشين خود تاكيد كرده و پنجاه در صد باقيمانده را بعنوان سهم چهار كشور تازه استقلال يافته بداند، اما ايران اين كار را نكرد. صفراف افزود: ايران پيشنهاد ‪ ۲۰درصد از خزر براي هركشور ساحلي را پيشنهاد كرده ولي طرفهاي مقابل به ايران تنها‪ ۱۳درصد اين دريا را پيشنهاد كردند كه اين امر به جايگاه ايران و نيز اقتصاد اين كشور لطمه وارد مي‌كند. بگفته اين كارشناس مسايل ايران در روسيه، ايران آمادگي حل عادلانه مساله خزر و استفاده از ذخاير اين دريا به نفع پنج كشور حاشيه‌آن را دارد و سفر پوتين به تهران و نشست سران مي‌تواند پس از سالها، در اين مورد نتيجه مثبتي داشته باشد. وي در عين حال پيشرفت در روابط ايران و روسيه را منوط به حل مساله درياي خزر دانست. "ولاديمير اورالف" ديگر كارشناس اين ميزگرد نيز با مهم توصيف كردن سفر رييس جمهوري روسيه به ايران، گفت: ايران يك طرف راهبردي براي روسيه بوده و از طرفي برنامه هسته‌اي ايران نيز دستور روز جامعه بين‌الملل است. "رجب صفراف" درادامه ميزگرد با اشاره به اينكه آژانس بين‌المللي انرژي اتمي هيچ سندي در مورد نظامي بودن برنامه اتمي ايران در دست ندارد، گفت: هيچ دولتي را نمي‌توان بخاطر داشتن سوء ظن مجازات كرد. وي گفت: پوتين نيز بخاطر اين سوء‌ظن به تهران نمي‌رود بلكه قصد دارد با ايران از جمله در زمينه هسته‌اي همكاري كند. صفراف در خصوص نيروگاه بوشهر كه توسط روسيه در دست ساخت است نيز اظهار داشت: راه اندازي اين نيروگاه در سال ‪ ۲۰۰۸علامت خوب مسكو به جهان خواهد بود. وي مذاكره درمورد نيروگاه بوشهر را از مباحث جدي احمدي نژاد و پوتين درتهران دانست و گفت: البته ايردهاي روسيه درمورد مشكلات مالي ايران براي تكميل اين نيروگاه، بيهوده است و پوتين در اين مورد اظهار نظر نمي‌كند. اين كارشناس مسايل ايران افزود: احتمالا پوتين به رييس جمهوري ايران پيشنهاد مي‌كند از غني‌سازي اورانيوم خودداري كرده و به وي تضمين خواهد داد تمام نياز ايران به اورانيوم غني شده در خاك روسيه رفع شود. بگفته صفراف در صورت چنين پيشنهادي، ايران آنرا رد خواهد كرد و وابستگي سوخت هسته‌اي خود به روسيه را نمي‌پذيرد و مقامات ايران نيز دلايل خود را به پوتين ارايه داده و اطمينان مي‌دهند كه از خواستهاي آژانس تبعيت كنند. "ضمن آنكه غني‌سازي اورانيوم در ايران نقض قوانين بين‌المللي نيست و آژانس نيز از همكاريهاي ايران رضايت دارد"
وي تاكيد نمود: در كيف پوتين، پيشنهادهايي براي همكاري با ايران وجود دارد كه مي‌تواند به اقتصاد ايران ياري برساند. اين ميزگرد با استقبال گسترده رسانه‌هاي خبري روسيه مواجه شده بود. "ولاديمير پوتين" رييس جمهوري روسيه قرار است روز ‪ ۱۶اكتبر (‪ ۲۴مهر ماه) براي شركت در اجلاس سران كشورهاي حاشيه درياي خزر عازم تهران شود. اكنون كه دانشگاه‌ و كارگاه و مسجد، جايگاه اعتراض و انتقاد نيست، اكنون كه روزنامه‌ها و راديو و تلويزيون در مصادره‌ي كامل كذابين و شايعه‌سازان و سانسورگران و تحريف‌كنندگان است، اكنون كه دادسرها موظف شده‌اند تا داد حاكم جبار و مسئولين خائن را، از رعيت مفلوك و مظلوم و دربند بستانند و در يك كلام، اكنون كه: تمام سرزمين ايران زير نعلين جنايتكاران است و هيچ نقطه‌ي امني در اين كشور پهناور وجود ندارد تا بتوان طرح مطالبه نمود، به ناچار به استاديوم مي‌رويم و با همه‌ي وجود فرياد سر مي‌دهيم: "مرگ بر استبداد" ؛ "مرگ بر ديكتاتور". بدينوسيله از تمامي آزاديخواهان و مخالفين حكومت ديني در داخل كشور بالاخص پايتخت‌نشينان دعوت مي‌كنيم با شركت در اين مراسم مسالمت‌آميز در عصر روز يك شنبه، 22 مهرماه ، 14 اكتبر، مخالفت خود را با دوام حكومت ستمكاران عصر و جلادين نسل اعلام كنند، هچنين از تمامي رسانه‌هاي آزاده در خارج از كشور مي‌خواهيم كه با برگزاري برنامه‌هاي فوق‌العاده و انعكاس اخبار مربوطه، از اين اعتراض خودجوش و مردمي حمايت كنند. به شركت‌كنندگان در اين مراسم باشكوه و تاريخي ابلاغ مي‌كنيم: از آنجا كه بنابر گزارشات درز كرده از سازمانهاي امنيتي و اطلاعاتي، عده‌اي از اراذل و اوباش وابسته به رژيم قصد دارند با ايجاد آشوب و تخريب اموال عمومي، بهانه براي سركوب و اعدامهاي ديگري به دست مستكبرين ديني دهند، تقاضا داريم هوشيارانه تدابير لازمه را اتخاذ كنند و همچنين از نهادهاي حقوق بشري و سازمانهاي خبري بين‌المللي مي‌خواهيم با دخالت مؤثر، هرگونه توطئه‌ احتمالي را خنثي كنند. این مراسم ابتدا در استادیوم آزادی و بعد از مسابقه، در خیابان آزادی برگزار می گردد. لطفا ديگران را در جريان قرار دهيد. Please see the press release below and spread the word. The Derafsh will flies over Statue of Liberty today. Also a test flight was covered by a local news channel in NY. See below. Statue of Liberty in New York will look on proudly on Monday October 15, 2007 as Iran�s ancient flag of the Kings, Derafshe Kaviani, flies overhead to signal the revolt of Iranians of every country, language, and religion against Iran�s repressive Islamist regime of Mullahs. The 25 x 25 foot Derafshe Kaviani will fly along Long Island, over the United Nations, and circle New York Harbor and the Statue of Liberty. The flight is timed to coincide with the ancient Iranian festival of Mehregan, the fall festival that also celebrates an ancient victory over oppression at which this flag was unfurled. The flag of the Kings, Derafshe Kaviani remains an important motif in Iranian art and culture, although its meaning has been repressed by the current regime. We raise this flag now to call on Iranians to renew their pride in their ancient culture and to rise once more, as their ancestors rose against legendary demons and conquerors, to establish an Iranian nation that is truly free. Derafshe Kaviani was first raised, according to legend, against the Satanic, evil dragon demon Zahak. In Iran�s national epic, Shahnameh Ferdowsi, the demon has become an oppressive Arab ruler. Kaveh Ahangar, the blacksmith rallied the people against him, using his spear and leather apron to remake the ancient flag and lead the people to victory. There is only one leader I respect & trust when it comes to Iran, and thats Reza Pahlavi. Please read the following article in Persian by Dr. Kianzad and let us know what you think? "Peace and Stability in the Middle East and Beyond: A Hostage to Iranian Intransigence and Adventurism." Speech given by Reza Pahlavi of Iran at Management Center Innsbruck, Austria. It is indeed a great pleasure for me to be among you tonight. I cannot help but recall some wonderful memories of my first trip to your beautiful country, some 32 years ago! I thank you for the opportunity you have given me to share my thoughts and perspective on a topic that rightly preoccupies the world. My country Iran, under the tyrannical rule of a theocracy, has unfortunately become a source of premonitions and fear rather than inspiration and hope. I shall begin by describing the background to current state of affairs. It has to do with the build-up of a strategy which I call �politics of Shiite hegemony�. In a quick sketch I shall also describe the various building blocks connected with this strategy prior to proceeding to demonstrate how the clerical regime has abused the advantages it has gained as a result of this strategy. Let me preface this presentation with a word about what remains uppermost in my heart and mind: My country Iran. Here, I should like to draw a clear line: As a nation-state and as a people, Iran and Iranians should not be confused with the clerical regime, and what it projects. Iran�s multi- millennia culture has suffered from the fundamentalist yoke, but is alive and defiant. Its strength has conditioned and reshaped the paradigm the Islamist regime had hoped to impose and perpetuate. This distinction is essential both for understanding Iran�s behavior as well as the dynamics it generates in the region. Late in August this year the Osnabrueck Symphony Orchestra from north-western Germany travelled to Tehran and played Beethoven and Brahms in Roudaki Hall � Tehran�s famous opera house. The previous year it was the Tehran Symphony Orchestra which had performed in Osnabrueck. This cultural exchange � a banal event in all other circumstances � was remarkable in some respects. If it evoked surprise and curiosity, even criticism in some quarters, for me, it was a comforting vindication of what I just said. But let me develop this thought just a bit more. Western classical music, to be sure, is not part of traditional Iranian culture, and yes it�s elitist. But the fact that the Tehran symphony Orchestra and the Roudaki Hall have survived the vagaries of these past three decades is yet another evidence that the forces of darkness, the cult of death, martyrdom and superstition has not conquered the spirit of our nation. We have seen more glaring examples of this reality in international film festivals, in world sport events, and still more in the unconquerable spirit of our women and in the daring defiance of our youth. Women have stood for their rights in a cult that prefers to relegate them to an inferior status as a household object. Our youth have defied and derided a regime which is not mindful of their future but is obsessed with the hereafter. The Iranian youth keep defending their right to live their age and the epoch in which they are born; that is to say in a world flourished by science and learning, and not mourning and martyrdom. People may have forgotten what that revolutionary paradigm might have looked like. At the onset of the Islamist revolution, in the shadow of kangaroo courts and massive executions, music of all kinds were banned from the airwaves. The universities were closed down and subjected to most vicious purges. The darkest names, the grisliest figures in our collective memory became the icons of the revolution; they were exulted and canonized. The core clique that dominated the revolution was of the same ilk as the Jihadists whom the world is now so familiar with. They came to power with a single-minded will to destroy past achievements and remodel our society after their medieval moulds. But Iran was and is a nation with a proud history and culture which in 1979 had behind it more than half a century of relentless and widespread reconstruction efforts. Yes, a theocracy was imposed on our nation, but it could not fully escape the imprint of that multi-millennia culture. This is one reason why Iran of today is the scene of stark contrasts, and its polity is so rife with complexities and contradictions. How did this state of mind resonate in regional politics, and more broadly in the international sphere? Let me first recall that thirty years ago Iran was still a force of stability in the region. Iran, under the previous regime, had succeeded to strike a balance between the principle of good neighborliness and its strategic concerns in the context of the cold war. Iran had aligned itself with America and the West for historical and geo-strategic reasons, but relations with the USSR were also friendly and productive. The old dispute with Iraq over a common stretch of waterway had amicably been resolved. So was an old claim of sovereignty over Bahrain. In the Persian Gulf, Iran saw to the safe flow of maritime commerce and the security of waterways. In Oman, Iran had intervened to help the sultanate quell a radically inspired insurgency. With the oil industry finally under full national control and the oil price optimized, my late father had held high ambitions for the future of our country. During the two decades before 1975, per capita income in Iran grew faster than in Turkey, while keeping pace with South Korea. By 1975, the level of per capita GDP in Iran had far exceeded those attained in Korea and Turkey. But the task remained unfinished, and in the zeal to achieve more and faster, a number of fatal errors were committed. This was the Iran that the revolutionaries inherited. I would like to dwell a little on foreign policy choices made at the onset of the regime, and its effects on regional dynamics. It will be seen that these decisions were not driven by national interest, but by ideology. Much of the choices made were underpinned on an ideological hostility towards the United States and Israel. Indeed, ever since the storming of the US Embassy in Tehran and the taking of hostages in November 1979, �militant anti-Americanism� has been the cornerstone of the clerical regime�s foreign policy agenda. Driven thus by a xenophobic claim to faith, the regime has moved quickly from its very outset to assert its Shiite identity by acting swiftly to mobilize Shiite communities in Iraq, Lebanon, Bahrain and elsewhere. The so-called �Shiite Crescent� label has only recently come to the vogue but there is nothing new about it. The first target in Iran�s strategy of Shiite hegemony was Iraq. When he came to power, Khomeini set out to replicate the Islamic revolution in Iraq. His ambition was to supplant the Baathist regime by an Islamic government modeled after the government he had himself established in Iran. The events that subsequently ensued, starting with Iraq�s aggression against my country in September 1980, are a matter of record; suffice it to say that, despite the very great sacrifices of the Iranian people which had succeeded in turning the tide against the Iraqi invaders by 1982, Khomeini refused the substantial offers of peace with reparations � and its attendant glory � in the vain pursuit of the same goals that had been at the heart of the conflict: Liberating Shiite holly places and establishing an Islamic Republic in Iraq. Six years and hundreds of thousands more Iranian casualties later, he realized he would not achieve that goal. In the end, his allegoric �chalice of venom� speech put an end to the longest conventional war in the century, and one of the bloodiest. As a result of Khomeini�s obstinate intransigence, Saddam Hussein had emerged from the eight-year war with Iran feeling stronger. Perhaps it was this notion of self delusion that impelled him to embark on a losing gamble in Kuwait. In any event, his invasion of Kuwait in August 1990 created a chain of events which has brought us to the present day situation that we face in Iraq and the region. It is no secret that policies pursued by Washington since the invasion of Iraq in April 2003 have created a new paradox. At least some of the objectives Iran had sought but could not obtain through eight years of war have now been attained as a consequence of American failures in Iraq. As a result, no one today disputes the fact that Iran exercises real influence in Iraq and that some of the current movers and shakers in the Iraqi government are figures who have a long history of collaboration with the Islamic leadership in Tehran. In Lebanon, the creation of Hezbollah was the second important building block that has now given shape to this now much talked about �Shiite Crescent�. Unlike what is often assumed, Hezbollah was not a product of Lebanon's demographic diversity and injustice to the Shiite community. Long before Hezbollah came into existence another Shiite entity under Imam Musa Sadr was active in Lebanon. AMAL, as that movement was known, was not just a politico-military outfit but was involved in social and community-based projects on behalf of Lebanese Shiites. The revolutionary regime in Iran was looking for a surrogate in Lebanon, and AMAL did not fit the bill. Consequently, as of the early 1980s, the regime�s henchmen � operating out of Damascus � set out to create a new entity that was launched in 1982 following the Israeli invasion of Lebanon. To supplant AMAL as the main Shiite movement in Lebanon, Hezbollah needed plenty of funds for its social projects, maintenance and training of its militia and other expenses which are currently estimated conservatively at half a billion dollars per year. Their benefactor was no other than the clerical regime in Tehran which was able to solicit the tacit support and assistance of Syria as well. A third element in the make-up of the strategy of hegemony has been the support of non-Shiite Arab extremist groups involved in Jihad against Israel. Again, the main Palestinian movement Fattah, headed by the likes of Yasser Arafat and Mahmoud Abbas, was seen as secular and ineffectual. Having over the years courted various extremist factions, the Islamic regime has today ended up embracing HAMAS and Islamic Jihad. While this right is recognized under the Non-Proliferation Treaty, its exercise has never been unconditional. In fact, Article IV of the NPT stipulates that this right should be exercised in conformity with the two main premises of the Treaty: namely, non-production and non-acquisition of nuclear weapons. Today, however, the international community is expressing its serious concerns because all objective indicators point to a conclusion that the clerical regime is hell-bent on acquiring nuclear weapons in order to ensure the continuation of its bloodstained rule at home, and the sealing of its hegemony in the region. The Iranian regime�s disingenuous pretences about need for nuclear fuel independence are also in stark contrast to Iran�s dependence on hydrocarbon sources of energy. The regime in Iran has only just begun to tackle the scandalous situation of petroleum imports and subsidies. Almost 30 years into the clerics� rule, Iran � of all places � imports 40% of its daily consumption of refined petroleum products from abroad. At a time when the country is so dependent on such a large quantities of gasoline imports for its day-to-day mundane needs, it is simply hilarious to watch regime figures pontificating about the country�s need for independence in the nuclear fuel cycle � particularly at a time when not even a single reactor has become operational. This ostrich-like posturing of course fools only the fools. Now I would like to turn to the central theme of regional politics, and see how the clerical regime makes use of the assets that it has acquired by design or default. It can be seen from what I have just outlined that the clerical regime has made use both of �soft power� � namely radicalization and manipulation of Shiite communities in the region � as well as �hard power� through heavy spending in armaments, including of course the very expensive nuclear weapons program, while at the same time retaining two parallel fully-fledged armies in the shape of the country�s regular armed forces and the �Iranian Revolutionary Guards Corps� or IRGC, whose nefarious involvements in extraterritorial adventures in places like Iraq, Lebanon and Afghanistan has been the subject of so much discussion in the past several months. Moreover, through its recent calls for the destruction of the State of Israel and its outright denial of the holocaust, the clerical regime has today firmly established itself as the dean of the region�s so-called �rejection front�. Not even Syria is quite in the same league, while its ideological offspring, Hezbollah, has lent credence to this pretension. It goes without saying that this kind of provocative posturing does have its appeal to large segments of frustrated Arab and Moslem citizens across the globe. Hezbollah has indeed played a triple role, all of which suit and cater to the interests of Tehran�s theocracy: Firstly, Hezbollah has created a strategic buffer against Israel not just for the rest of Lebanon and Syria, but significantly also for Iran. Invariably, the summer of 2006 battles in southern Lebanon were seen as a proxy war between Iran and Israel, and by extension with America. According to most analysts, in any plan for a pre-emptive strike against Iran�s nuclear installations, Hezbollah is no doubt a factor that will need to be reckoned with. Secondly, thanks to Iranian petrodollars, Hezbollah maintains a gigantic welfare machine for the Shiite community. Finally, by the same token, Hezbollah has become a domineering political force in Lebanon acting to sap the country�s independence in favor of Syria, and preventing the more moderate political factions. Recent tragic events in Lebanon once again brought to light the vicious designs orchestrated by Iran against the democratically elected government of Lebanon. The clerical regime�s leadership of �the rejection front� is more pronounced in Palestine. The mullahs support HAMAS in its face-off with Al-FATAH and in its defiance of Israel. Other radical Palestinian groups who refuse to acknowledge Israel have equally been supported. The clerical regime thrives in the current impasse and would want to perpetuate it. As long as peace in the Middle-East remains elusive, Hezbollah, the Islamic Jihad, HAMAS and other clients of Iran and Syria could claim legitimacy among the Arab masses from which Tehran�s theocracy gains political mileage. If peace finally is achieved, the clerical regime would be nobody�s hero outside a strictly sectarian setting. In Iraq, the situation is equally complex. Iran drew unhoped-for dividends from the American venture in Iraq. As I already pointed out, forces that some 27 years ago were unleashed by Khomeini to overthrow Saddam Hussein and replicate the Islamic revolution are now in position of influence or power. But challenges to the ascendancy of the new Shiite-based ruling circle are taunting and relentless. There are Baathist remnants, dispossessed of power, who joined the disgruntled Sunni tribes in an insurgency to restore themselves to pre-eminence; there are the Al Qaeda linked insurgents who seek to oust Americans and the Shiite parvenu in order to gain a foothold. Some regional powers are concerned about Iran�s influence and Shiite ascendancy at the expense of the Sunnis. Within the Shiite factions also an undercurrent of enmity and resentment is palpable. Different rival militia groups attached to Supreme Council for the Islamic Revolution in Iraq (SCIRI) or Muqtada al-Sadr have been engaged in infightings in a quest for ascendancy. They have penetrated the security forces and are involved in daily acts of kidnapping and murder. How do the ruling mullahs in Tehran exploit the situation in Iraq to their advantage? The first point to consider is that in the mullah�s psyche the instinct of self preservation is paramount. From this perspective, their first priority should be to get the American forces out of Iraq, and Afghanistan for that matter. The strategy to achieve this is simple! Prolong the current state of chaos and mayhem beyond the patience of the American public and the life-span of the current administration. To achieve this goal, the number of the American casualties in Iraq should go up; hence the supply of IED�s (Improvised Explosive Devices) and funding and training of various insurgents to exhaust the American will to continue with its mission in that country. The second priority is to ensure an enduring foothold in Iraq and perpetuate the Shiite ascendancy. The current Shiite ruling circle under prime-minister Maliki � in spite of having undisputable ties with Iran � could not fully be relied on as a long-term ally. The clerical regime is therefore seeking to build up a bogyman modeled after Hezbollah to act as its surrogate in any future civil war, thus ensuring the preservation of Iran�s influence in Iraq. Who other than Mugtada al-Sadr could fit the bill? The recent pull out of al- Sadr ministers and deputies from Maliki�s coalition is a clear indication of the rift, not just within the coalition, but also between Maliki and the Islamic Republic. It should further be noted that among the main Shiite poles of power, only al-Sadr fully subscribes to Iran�s objective of getting American and allied forces out of Iraq. There are similar policies and patterns, albeit on a smaller scale in Afghanistan, but in the interest of time I shall forego entering into that aspect. Does the �Shiite Crescent� and the politics being built around it make Tehran�s theocracy a great regional power? There are some analysts who argue that Iran has already emerged as a regional super power. As always there are some elements of truth in any hype, but in my view, such a premise is fundamentally faulty and flawed. The sheer size of Iran and its geo-strategic location no doubt imparts on Iran the status of a major regional power. This is a country of 70 million inhabitants spreading over 1.6 million square kilometers which includes the entire northern shores of the Persian Gulf and the Arabian Sea. The current problem is that the clerical regime has sought to impose its hegemony beyond what is inherent in its geo-strategic profile. This has in turn generated a strong current of opinion that advocates both engagement and negotiations with the regime. Nonetheless, today there are clear signs that the politics of Shiite ascendancy and regional adventurism pursued by Tehran is starting to backfire. In the opposite horizon, a new arch � that of a Sunni alliance led by a number of key Arab countries � is starting to emerge. Today, this confrontation is becoming more evident in places like Iraq and Lebanon where, armed with Arab funds and other material support, the Sunnis have started to copy the kind of structures the Shias have been developing in the past two decades. Prior to concluding my remarks, let me say a few words about dialogue and engagement with the clerical regime. While such an approach is, as I just said, being advocated by a main current of opinion, there is another extreme who argue for the military option in the shape of military strikes, even all-out war. I have time and again expressed my firm opposition to any military solution. Moreover, the current talk of war could alienate public opinion inside my country and even unite it behind a much despised regime. Iranians in their great majority have friendly feelings towards the United States and the West. Therefore, it is important that they should not be let down. There is no doubt that dialogue must be privileged in all circumstances. But those who confuse the process with purpose and view negotiations as a panacea are in for disappointment. Henry Kissinger once rightly pointed out that "diplomacy never operates in a vacuum;" it succeeds when the parties arrive at a frame of mind or at a realization that the risks involved in non-negotiation outweigh benefits of preserving one's original position. The process of give-and-take that results from negotiation is incidental to that paramount realization. Have the ruling mullahs reached that mental threshold? The answer in my judgment is negative, although a resolute global strategy � short of resort to military action � could transform the current mindset. A few years ago we saw such a transformation in the attitude of Colonel Muamar Qaddafi in Libya. But here, I want to emphasize the following: I should like to strongly point out that no durable settlement of dispute with the Islamic Republic can ever be achieved, should that settlement be reached at the expense of the Iranian people. In clarifying this point even further, I must stress that while Iran�s nuclear ambitions are at present, the focus of international attention and scrutiny, most Iranians are hoping that the current level of unprecedented pressures will not only help end the current threat which the clerical regime is posing to regional and international security, but to also usher in a new era where notions such as freedom, democracy and human rights are all fully adhered to by a responsible government that is both of the people and committed to the future welfare of the people. My country, Iran, is youthful in its demographic properties, rich with a multi millennia culture and an alive and vibrant society. In our defiance of the ruling theocracy, my compatriots need and deserve all the moral help and support they can get in order to bring about fundamental change by establishing a system of governance that is in keeping with the imperatives of our time: a secular democracy in place of the current ruling theocracy. only seen and used by Prince Reza Pahlavi. not be shown on site or anywhere public. print the document and sign it yourself. could be by email, fax, or post. Sign the Petition as option 2 above.